New Horizons has sent back new Pluto close-up photos that not only reveal the planet in the most stunning detail yet, but are a treasure trove for astronomers as they pose more questions than answers. The new Pluto close-up photos have taken nearly two months to travel the vast distances of the solar system, but for NASA astronomers it appears that it was worth the wait. Seen at a resolution of 400m-per-pixel, the photos are not only beautiful in terms of their clarity, but also reveal a whole range of possible features that NASA says shouldn’t really be there. Among the new features discovered include possible dunes, nitrogen ice that once flowed from the mountainous regions onto plains, and even networks of valleys that could have been created by material flowing over Pluto’s surface. They also show large regions that display chaotically jumbled mountains reminiscent of disrupted terrains on Jupiter’s icy moon Europa. 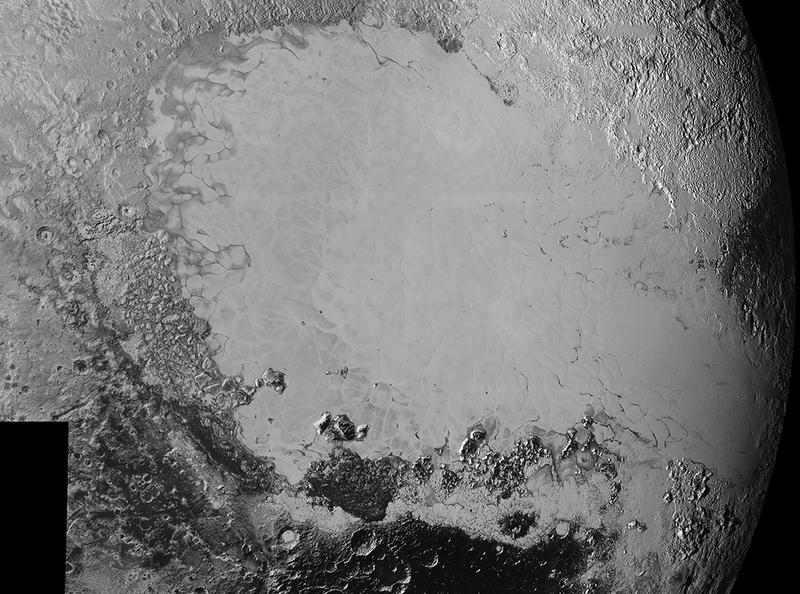 “Pluto is showing us a diversity of landforms and complexity of processes that rival anything we’ve seen in the solar system,” said New Horizons principal investigator Alan Stern. The dunes, in particular, are what are catching the attention of those of us on Earth as, from the new close-up photos, the dunes appear windswept, which, NASA says, would be incredible. The chaotic terrain surrounding the Sputnik Planum. 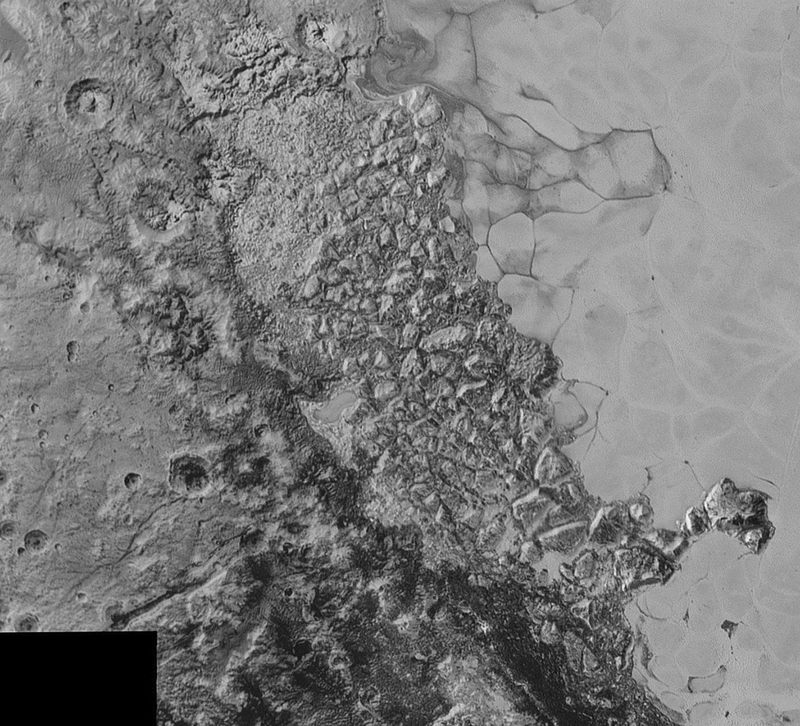 Two images taken by New Horizons of Pluto’s haze with a un-processed image view (left) and a processed one. New images have also returned giving us our closest view yet of Pluto’s largest moon, Charon, from a distance of 470,000km from its surface, and they appear to show considerable evidence of tectonic activity in its past. 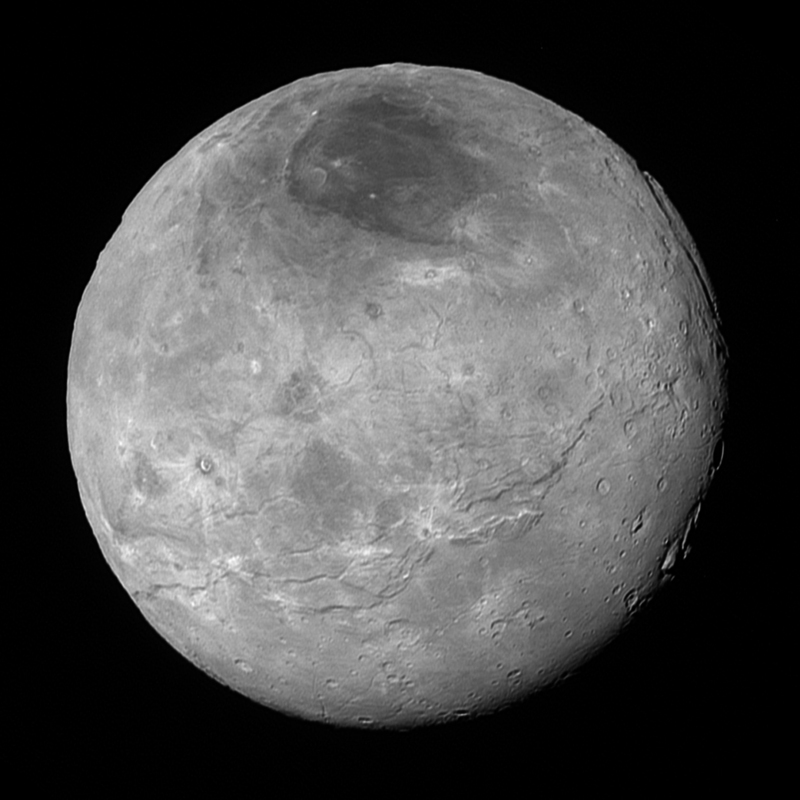 Charon up close and personal.